Take just one sip of this heavenly lemonade and we promise you’ll be hooked! Enjoy this delightful twist on a classic beverage all summer long! 1. Make a blackberry simple syrup. Combine sugar and 1 cup water in a small saucepan. Cook over medium-high heat, stirring, until the mixture comes to a boil and the sugar has dissolved. Add the blackberries. Reduce the heat to low and simmer until blackberries are broken down and softened (about 3–4 minutes). Remove from heat, let cool to room temperature. 2. Strain the syrup through a fine-mesh sieve. 3. 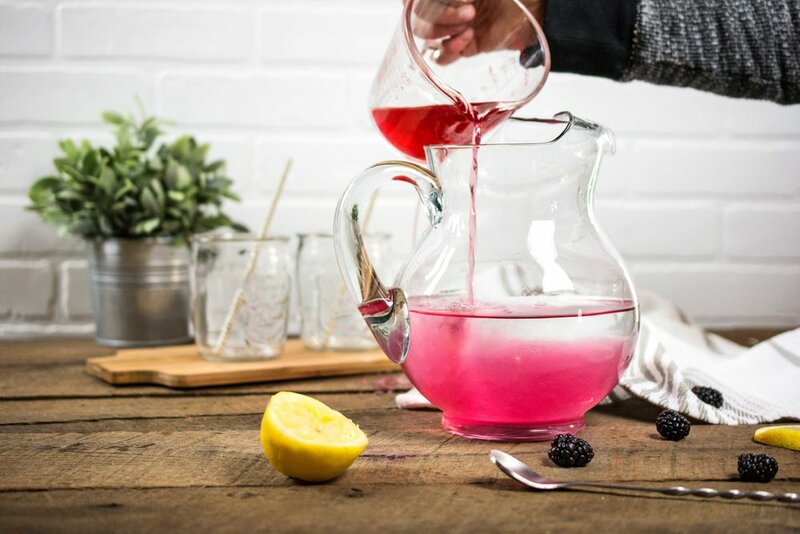 Pour the remaining 5 cups of water and the lemon juice into a pitcher. Whisk in the blackberry simple syrup and chill in the refrigerator for about 30 minutes. 4. When chilled, serve over ice with a slice of lemon and fresh blueberries for garnish. Other tasty options: serve with fresh mint, fresh basil leaves, grated ginger, or rim the glass edge with sugar and cayenne for a spicy accent.